The Asia-Europe Meeting (ASEM) is an informal process of dialogue and cooperation bringing together the 28 European Union member states, 2 other European countries, and the European Union with 21 Asian countries and the ASEAN Secretariat. The ASEM dialogue addresses political, economic and cultural issues, with the objective of strengthening the relationship between our two regions, in a spirit of mutual respect and equal partnership. But ASEM is not only a high-level platform of regional relations based on multilateral and equitable partnership but also is a platform of relationship and cooperation among citizens. As of today, 14 political, 51 economic and 51 socio-cultural initiatives and programs are being implemented within the framework of ASEM. When and how did ASEM begin? ASEM saw the first enlargement in 2004 during the5th ASEM Summit (ASEM5) in Hanoi (Viet Nam), where the 10 new EU Member States (Cyprus, the Czech Republic, Estonia, Hungary, Latvia, Lithuania, Malta, Poland, Slovakia, Slovenia, Luxembourg) and 3 new ASEAN countries (Cambodia, Laos, Myanmar) became officially part of the ASEM process. The second round of enlargement in 2008 during the 7th ASEM Summit (ASEM7) in Beijing (China) brought in 6 new members: Bulgaria, India, Mongolia, Pakistan, Romania, and the ASEAN Secretariat, increasing total ASEM membership to 45 partners. In October 2010, the 8th ASEM Summit (ASEM8) of Heads of Government and State in Brussels (Belgium) welcomed 3 new member states to the ASEM process. (Australia, New Zealand, and Russia). This third round of enlargement increased total ASEM membership to 48 partners. In November 2012, during the 9th ASEM Summit (ASEM9) of Heads of Government and State in Vientiane (Lao PDR), Bangladesh, Norway, and Switzerland officially joined. This round of enlargement brought total ASEM membership to 51 partners. The latest round of enlargement during the 10th ASEM Summit (ASEM10) in October 2014 in Milan (Italy) welcomed Croatia to the European side, and Kazakhstan to the Asian side. This brings the total ASEM membership to 53 partners. What makes ASEM unique from other international summits? During ASEM, the parties conduct talks, negotiations, and debates on a broad spectrum of issues based on principles of mutual respect and benefit. ASEM has become an open platform for an exchange of opinions, and expressing of views on interested issues by decision- and policy-makers, researchers and academia, civil society personalities and business people. It also pursues the objective of bringing together the two regions by way of discussing pressing political, economic, social and cultural issues of common concern. 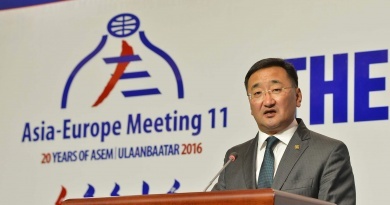 What message is Mongolia planning to send internationally during the ASEM Summit? Almost 1,000 of the 5,000 delegates to the 11th ASEM Summit are expected to be journalists News outlets, and media representatives. Mongolia is focused on taking this global promotion opportunity and showcasing itself as a modern country with a unique history, culture, and customs. It would also be important to show Mongolia as a country with a rapidly developing economy and a reliable destination with a favorable business and legal environment for investors. The ASEM Summit and its nine side events will be held in Ulaanbaatar and to this end, the Ulaanbaatar Municipality is organizing many art and cultural functions, and festivals. What activities does ASEM have to bring together the Asian and European citizens? Since ASEM is committed to strengthening the relationship between Asia and Europe regions, the collaborative platform is multi-dimensional, focusing on not only political but also economic, socio-cultural, and educational collaborations. Many annual and biannual events organized on different levels can be attended by all citizens of Asia and Europe. For more information, visit ASEM Infoboard. What is the Asia-Europe Foundation? What does it do? The Asia-Europe Foundation (ASEF) was established in Singapore in 1997 with the objective of deepening friendship and mutual understanding among the peoples of the two continents, and ASEF to this day remains the sole established institution of ASEM. ASEF carries out activities in the following four areas: intellectual exchange, people-to-people exchange, cultural exchange, and interaction with the public. Its Board of Directors, consisting of representatives from all the member countries, outlines the strategy, principles and priorities of the Foundation, and considers and approves the Foundation’s annual budget and projects. ASEM is financed through voluntary contributions by the Governments and private sector of the ASEM member countries. Activities organized by ASEM are financed by the Asia Europe Foundation. What issues have been discussed during the 9th Asia-Europe Parliamentary Partnership Meeting (ASEP9)? The meeting of parliamentarians was the first of the nine side-events organized before the 11th ASEM Summit in Ulaanbaatar. The 9th biannual convention of the Asian and European parliamentarians, the ASEP9 has been held under the theme of “The role of Asia-Europe Parliamentary Partnership in ASEM” with two panel sessions on “Connectivity and Effective Multilateralism,” and “Partnership for the Future”, and a concluding plenary meeting which adopted the concluding document. The meeting was held at the Government House on April 21-23. More than 170 delegates from 32 countries participated in the meeting. Model ASEM is a simulation of the Asia-Europe Meeting (ASEM) Summit to generate interest and increase awareness of the ASEM process among university students and young academics. It takes place in the same month as the ASEM Summit and it is a 3-day academic conference and simulation exercise, with the latter being based on the Summit’s procedures, programme and agenda. Youth participants from 51 Asian and European countries form delegations. Each delegation comprises of 3 students from different nationalities, including one head of delegation. The participants of Model ASEM will discuss problems and challenges facing the regions, which will be reflected in the document of the Summit. For the 7th Model ASEM in Mongolia, panel meetings, workshops, and bilateral meetings will be held on political, socio-economic and cultural issues, and cultural events will also be organized. What issues are on the agenda of Asia-Europe People’s Forum? The Asia-Europe People’s Forum, which will be held under the theme “Building New Solidarities: Working for Inclusive, Just, and Equal Alternatives in Asia and Europe”, will outline ways and means of realizing the vision of the peoples of Asia and Europe for development and progress. There will be more than 500 guests and delegates, including 250 from within Mongolia, attending the forum. What issues are on the agenda of Asia-Europe Business Forum? The Asia-Europe Business Forum (AEBF) is a meeting of business leaders from Asia and Europe, created by the Asia-Europe Meeting (ASEM) to strengthen economic cooperation between the business sectors of the two regions. The 15th Asia-Europe Business Forum will be held on July 13-14, to be immediately followed by the 11th ASEM Summit. The AEBF is expected to attract around 600 high-level business representatives and CEOs from ASEM partners, providing them with unique opportunity to network, to discuss the most pressing issues of Asia-Europe economic cooperation, and to contribute to shaping of the ASEM agenda by engaging in a concrete dialogue from Europe and Asia. What issues are on the agenda of ASEM Finance Ministers’ Meeting? The ASEM Finance Ministers’ Meeting is an integral element of the ASEM process. Earlier ASEM Finance Ministers’ Meetings have pursued a dialogue on matters of common interest, in such fields as exchanging views concerning the global economic outlook, the international financial architecture, the more effective implementation of existing supervisory principles and regulations in the financial sector, combating money laundering, and strengthening cooperation in the field of custom. The 12th ASEM Finance Ministers’ Meeting will be held on June 8-9 in Ulaanbaatar under the theme “Partnership for Prosperous Connectivity between Asia and Europe”. What results are expected from the 11th ASEM Summit? As a result of 51 Heads of State and Government convening at the ASEM Summit, the consensus of discussions will be issued as the Chairman’s Statement and the Ulaanbaatar Declaration. The Declaration will sum up the work accomplished in the last 20 years of ASEM, the present level and the future goals and trends of ASEM. Is it true that local flights will be suspended during ASEM? This is not true. Local flights to and from Ulaanbaatar will be navigated and re-routed from the Defense Ministry’s aerodrome at Nalaikh District only on July 15 and 16 during the 11th ASEM Summit. Throughout the rest of the ASEM side events period, the local flights will operate with its regular schedule from the Chinggis Khaan International Airport. 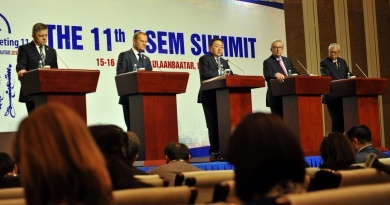 Where are the resources of organizing the 11th ASEM Summit in Ulaanbaatar coming from? A considerable number of Mongolian citizens have voiced their concerns about hosting the ASEM Summit when the economy is in trouble. Although a certain amount of budget has been allocated from the government, the ASEM Summit is not organized single-handedly by the host country, as the 51 other ASEM member countries and 2 international organizations also assist and are involved in its organization, donating special equipment, office furniture, vehicles, and providing expertise and training. Also, the National Council to organize and oversee the ASEM11 has asked for private sectors to help with in-kind contributions in logistical arrangements as well.